K.C., aka TX's Repoman, is a handsome 6-year-old fawn big boy, born November 8, 1997. 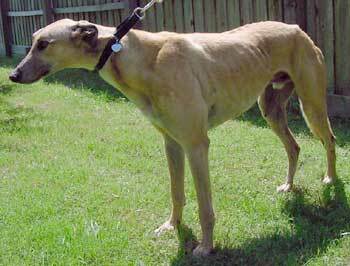 GALT received a call from a lady who lives in Kaufman County about a greyhound who wandered into her yard. She took him in and cared for him until we could pick him up and here he is - a loveable, sweet boy! K.C. 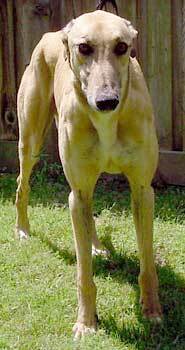 raced in Corpus Christi from April to August 2002, and is looking for his forever couch. It is not known at this time if K.C. is small animal or cat tolerant. "K.C. loves to play "ball" and would be an excellent Soccer player for the Burn! He is such a "guy" and has quite a personality to match. He is a big, big boy and has the largest greyhound paws I've ever seen! Some of his excellent qualities are: he doesn't charge the kennel door, he allows you to manipulate him; he does an easy, easy sit; he is very good on the stairs, up and down; and does excellent at heeling and making turns; doesn't "paw" or jump on you. He is very food oriented, which makes training him easy. K.C. is a Greyt grey and will be adopted fast because he has so many really good qualities and is so handsome! It is obvious that he was a very, very competitive Athlete and a Champion!" "We had him for over two years up here at Bluffs Run, and I wish we could have kept him for his whole career. No doubt he would be on my couch right now. He was very spoiled because he was a very special dog - so much personality and so much fun to have around! He loved to give hugs. His favorite game was to try to get your shoe and run off with it - he'd grab the laces or any part he could and take off, whether you were in the shoe or not. Walking with him was an adventure at times. He didn't get much discipline, we pretty much let him do whatever he wanted, he was just a doll. He always knew it was playtime and would get excited when you said his name a certain way. If you've ever seen the old superman tv show, how they said his name in the intro. Reeeeeeeep-o man, heavy emphasis on the first syllable. That was his cue to get wild and wiggley. It about broke my heart when I saw how thin he was in the photo on your website. He ran at 87 here and could easily have carried a couple more lbs. He is so very different from the littermates of his we had here, neither of them were nearly as social or outgoing as he was. He liked kids (had to be careful with little ones as he would lean on them and they would fall over). He is truly a doll and one of the most special greys of all the thousands I've handled. I'm glad he's with people who will find a home that will cherish him as he so very much deserves."